Raw Silver, Red or Black - 2 finger grab! Fast50s "Shorty" Billet Front Brake Lever. -Fits OEM throttle or Fast50s Billet Throttle. CNC machined billet lever is made from aircraft grade 6160 aluminum. Broke, bent or lost your stock lever in a crazy smelting accident? 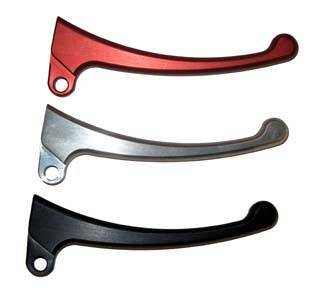 We help you 2 finger it out with a trick "Shorty" 2 finger brake lever. Great quality, easy to fit in seconds and has an amazing feel.